Stop putting things off. Start taking things on. Almost anything that is worth doing is a struggle. Almost anything that benefits other people is tough to do. Almost anything that makes a difference in this world is hard to see through to the end. Which is why, we’ll often do almost anything to escape doing it! Yet we want to love people well, even when they’re difficult… tackle challenges that we find difficult… and keep moving forwards through times that prove difficult. Deep down we want to get on with doing hard things, fix what needs fixing and change what needs changing. This book shows us how a bigger, better picture of Jesus will transform us. Our panic and tendency to avoid difficult things can be replaced with joyful, get-things-done confidence and proactivity when we depend on God’s power. If you avoid difficult things but want to change, this book is for you. 3. How Can You Mend a Broken Heart? We have made escapism a contact sport. We have so many devices and distractions to keep us busy from an involved life. This book is easy to read, full of self-deprecating humour with plenty of practical examples of people like you and me. Reading a book on escaping escapism is the easy bit, but Dave explores the wisdom contained in Scripture and a relationship with God to help us in our daily lives. This is a hopeful and encouraging book. What a fine and useful book! It is a really helpful combination of contemporary perception, Biblical insight, practical advice, and an attractive and compelling style. I had not realised my own brilliant escapist ability until I read this book: and it also gave me Biblical and Christ-centred hope! Refreshingly honest and regularly funny, Dave helps us to develop Christ-like, everyday courage by exposing our escapist hearts to who Jesus really is. However you might be seeking to escape from reality this wonderful book will help you return with real joy to the Good News that we so often fail to let determine every part of our lives. knowing and trusting Jesus enables us to do hard things rather than escape from them. “It shows us how a bigger, better picture of Jesus will transform our lives,” says the blurb, and who can quarrel with that? The message is that our panic and tendency to avoid difficult things can be replaced with joyful, get-things-done confidence and proactivity when we depend on God's power. As well as thinking about the opportunities and possibilities, most of us will probably be aware of situations we’re not looking forward to: relationships we keep at a distance, decisions we’d rather not make, areas of our lives we’d rather avoid. 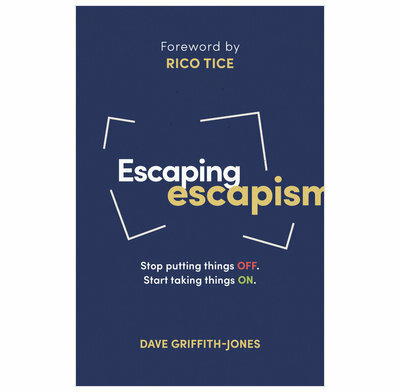 Dave Griffith-Jones is a church leader in East Hull and the author of the recently-published, Escaping Escapism, which is a refreshing call to face up to things we’re avoiding with our trust in God. He kindly let me ask him a few questions about how we might all escape ‘escapism’ this year – and I found his answers really stirring.